Rather difficult to swallow… | machinehead! ← Mable CD packaging just arrived! 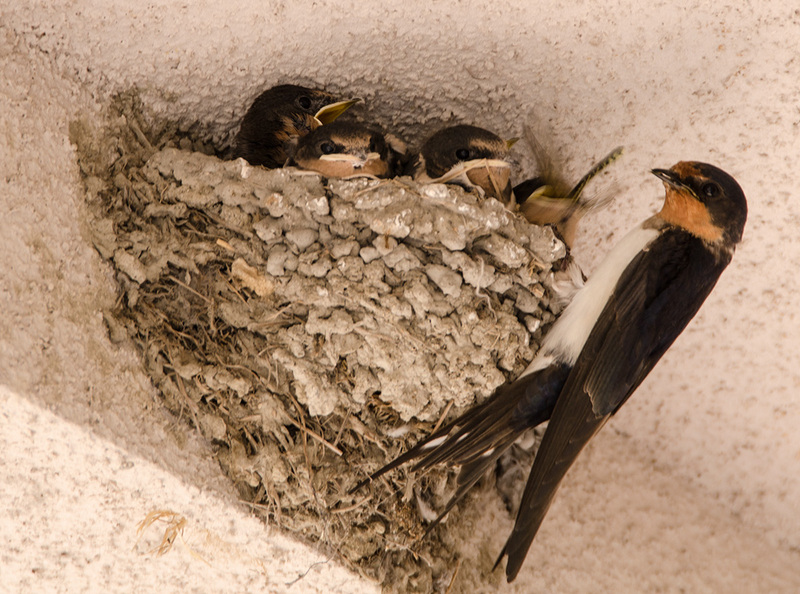 For the past 5 or 6 years, we have had a persistent pair of swallows (tsubame here in Japan) who have been nesting above our front porch. Until this year they have been dismal failures as prospective parents. The first year the nest fell apart before they started nesting and same with the next year, I believe. The next year they started nesting but apparently didn’t incubate the eggs properly so nothing came of it. The following year, babies were finally born but the nest was raided by a predator bird (perhaps a crow) that wiped out the hatchlings. Finally, this year they got it right! Five eggs laid and five healthy chicks have been growing daily until finally today all but one of the chicks have flown the nest. 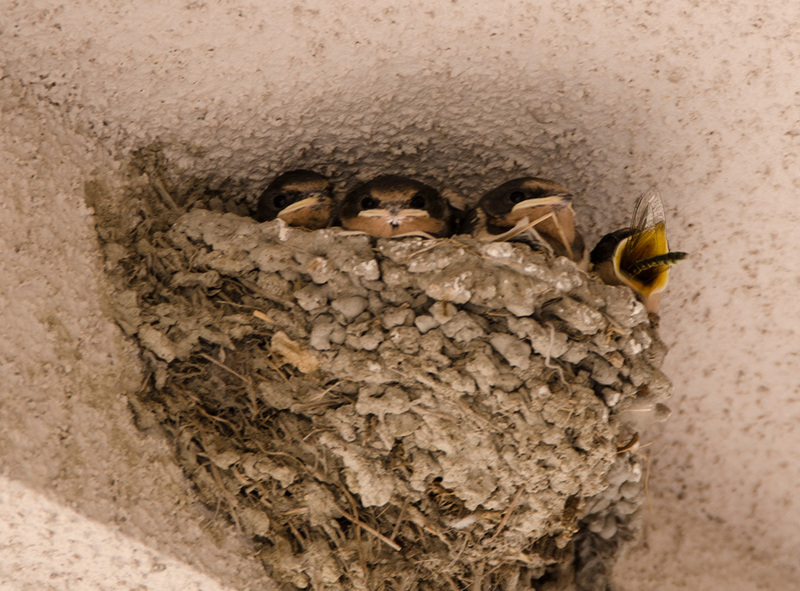 As I write, the parents and the little guy’s siblings are flying around the nest encouraging him to take the plunge. We have been watching the whole process with great interest and are so happy to see them finally succeed! There were some anxious moments yesterday as part of the nest fell apart leaving the chicks precariously hanging on and nowhere for the parents to sleep, but they made their way to flight just in time. Actually I am especially glad for this happy outcome as I have largely been the blame for the swallow’s (until now) chronic failures. You see, when they first came to build their nest I took a hose to it several times to shoot the mud down as they tried. 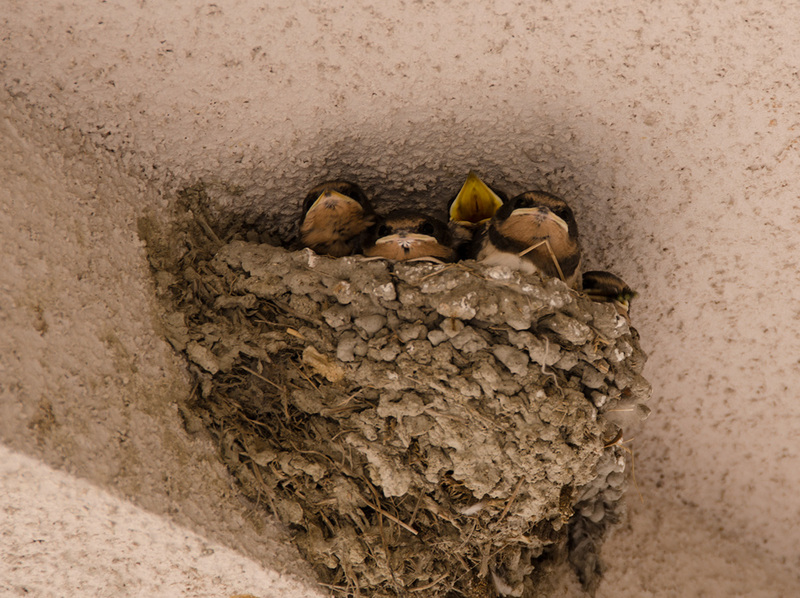 We had just moved into our new home which was being caked in mud and bird droppings and, as much as I love birds, was having none of it. I was soon informed that having a tsubame nest is considered good luck so I soon stopped the counterattack but my wife was convinced that it was my evil act that started them off on the wrong foot (or wing as it were). So now I am finally off the hook! It really has been inspiring to watch them go at it. Especially after the babies were born. The parents tirelessly worked from morning til dark catching and feeding insects (often as big as the chicks!). Their perseverance and selflessness made me feel inadequate as a parent (I mean, when was the last time I fed my daughter a nice dragonfly?). As some of you country folk can no doubt tell, I’m a citadin and rather unconnected with nature. I’m sure many of you have had occasion to witness such things on a regular basis but for me, I have been quite moved by the whole thing. The persistence, the effort and the beauty of it all.